Every day A wakes up in the body of a new person. A has no idea who the person will be or what sort of life they will have. A has come to terms with this sort of life and makes sure to live by the following rules: avoid being noticed and do not interfere. 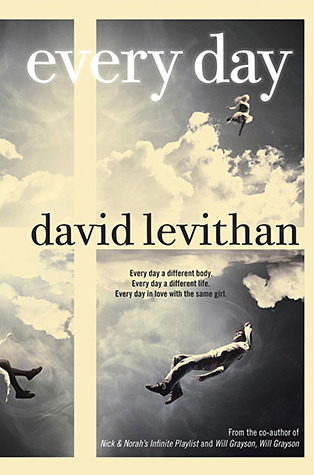 But one day A inhabits the body of Justin, a 16-year-old boy with a girlfriend named Rhiannon. A cannot stop thinking about her, and suddenly the rules of A's life have been thrown out the window. A wants to be with Rhiannon every day, and in order to make that happen, the rule "do not interfere" suddenly gets cast aside in a desperate attempt to keep Rhiannon in the picture. 1) Suspending my disbelief. There was no real world building in order to understand how it's possible for a person to have spent their whole life traveling from body to body every day. I think Levithan was going for more symbolic and philosophical themes and that's why he felt like he didn't have to answer that question (this is merely conjecture on my part) but as someone who prefers realistic fiction to fantasy, this was something I honestly could not get past. 2) The ending. Huh? I just didn't get it at all. And the unanswered questions make me wonder if Levithan is planning a sequel. Or maybe he just likes to torture his readers with questions lingering in their minds. I don't know. I felt like just when A was starting to figure out why this happens to him/her, the book ended. Despite my frustrations, it really was a worthwhile read, one that asks you to examine your own life and what you would be willing to do for love. And part of me wonders if Levithan intended for readers to have these frustrations in order for more colorful and lively discussion. I could see this being a fantastic book club or literature circle pick for that reason. I totally agree with you. That ending wasn't good enough. So many questions needed to be answered. A sequel is definitely needed. Anyways, great review! I loved this book.